When launching and maintaining a cloud-first infrastructure with Amazon Web Services (AWS), Microsoft Azure, or GCP, it’s easy to lose track of underused or underutilized items. However, properly managing cloud resources is one of the most effective ways to reduce your monthly cloud spend. In this foundational webinar, we walk through initial challenges you may face after migrating to the cloud, and discuss different ways to tackle them. Cloud Management Platforms (CMPs), like CloudCheckr, regularly check for underused and underutilized items in your cloud and present them to you with options for the next step. CloudCheckr makes recommendations based on analytics, and the results speak for themselves: Customers typically report saving 30% on their cloud spend per month. 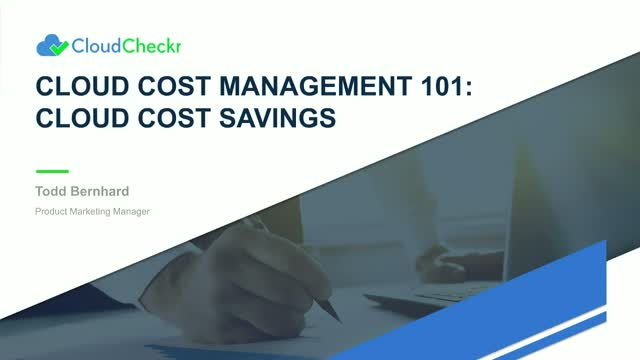 This 101 session is part of a comprehensive Cloud Cost Management mini series, designed to arm you with the essential knowledge you need to succeed in the cloud. You will learn cloud cost best practices, tips and tricks to better optimize your AWS and Azure consoles, and utilization best practices. This webinar is designed for service providers, resellers, and public sector organizations.